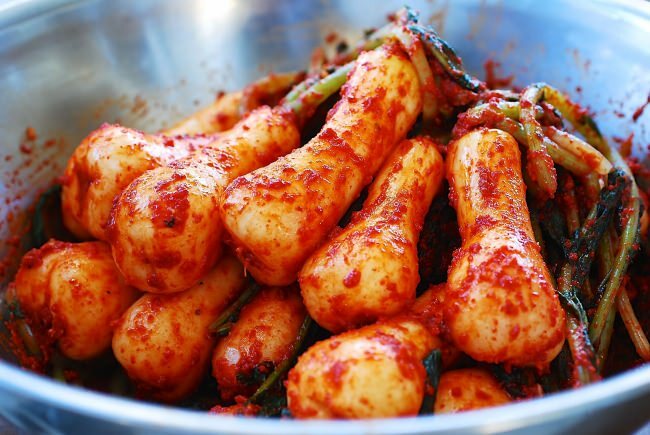 Chonggak kimchi is a popular kimchi in Korea. 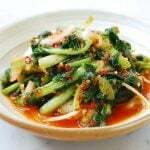 It’s made with a small variety of white radish with long leafy stems, which is firmer and crunchier than the large varieties. 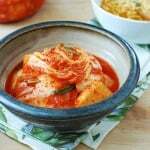 With normal kimchi seasoning ingredients, you too can make chonggak kimchi at home with this easy-to-follow recipe! 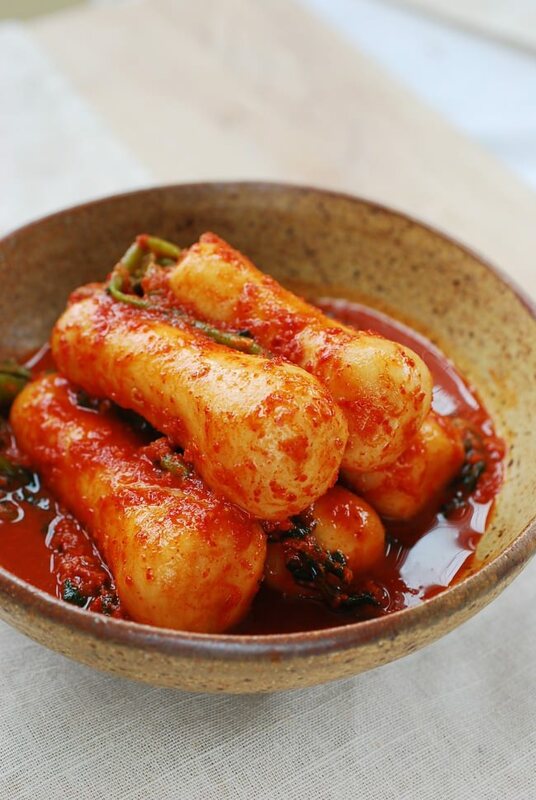 Chonggak kimchi (총각김치) is another popular type of kimchi in Korea. 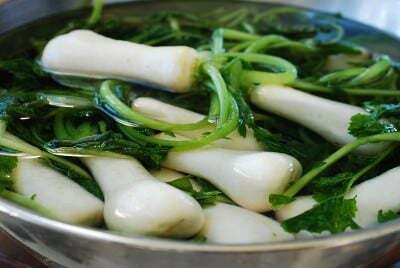 It’s made with chonggak mu (총각무), which is a small variety of white radish with long leafy stems. This small variety is firmer and crunchier than the large varieties of white radishes. Chonggak mu is also called altari mu (알타리무). The word chonggak (총각) means “bachelor” in Korean, and the word originated from the ponytail hairstyle, called chonggak, young boys/men used to have in the old days. It’s commonly believed that this radish was given its name because of long leafy stems resembling ponytails. 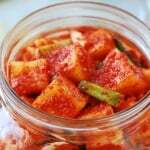 This kimchi is often translated to “bachelor kimchi” in English. Look for small to medium radishes with smooth skin and fresh, tender green leaves. 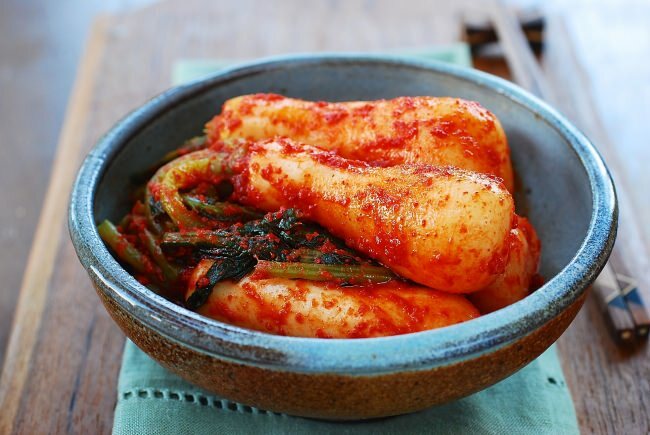 This reminds me of the chonggak kimchi my mother-in-law used to make with her own crop from her backyard. She would always pull the radishes while they were small to make sure they were sweet, tender, and crisp. 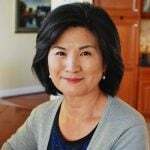 Her chonggak kimchi was the best! Chonggak kimchi is made with the stems intact. 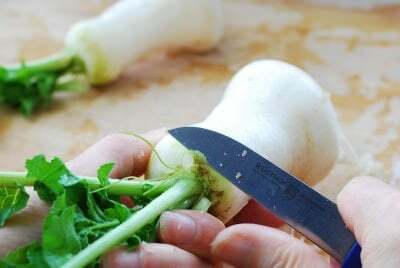 You can cut the stems into shorter lengths, leaving some attached to the radish. Also, if the radish part is too thick, you can half (quarter) it lengthwise. The salting time varies depending on the size/thickness of the radishes and the salt you use. The radishes don’t need to be salted all the way to the center. 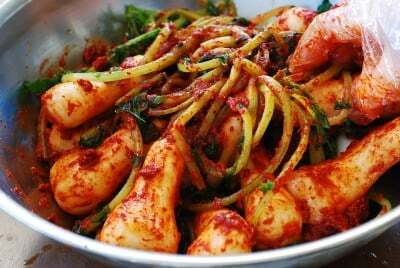 In fact, kimchi will taste better if you don’t draw out all the radish water content by over salting them. I used a combination of fish sauce and saeujeot (salted shrimp) using more fish sauce. 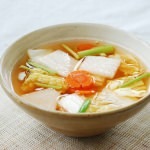 The taste will be milder if you use more saeujeot than the fish sauce. You can also make it with fish sauce only. 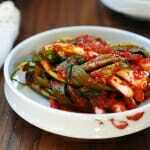 You can serve chonggak kimchi whole or cut into smaller pieces. 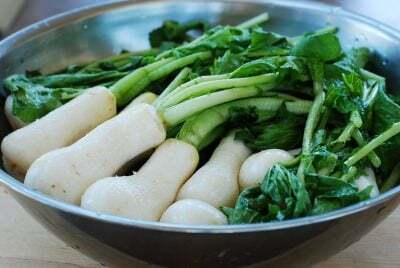 Most Koreans enjoy picking up a whole radish with chopsticks, and biting off a piece at a time making loud crunching noises. Fun and delicious! 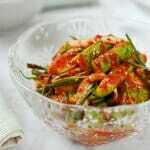 Chonggak kimchi is made with a small variety of white radish with long leafy stems, which is firmer and crunchier than the large varieties. 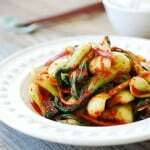 With normal kimchi seasoning ingredients, you too can make chonggak kimchi at home with this easy-to-follow recipe! 1/2 gallon airtight container or jar. Wash the radishes a couple of times to remove excess dirt. You will wash them again after salting. Cut off the root end of each radish. Trim off the darkish skin on the top end that is connected to the stem. Scratch off the stubborn impurities with a small knife. Do NOT peel the skin. Remove any bad leafy stems. In a large bowl, place a few radishes and generously sprinkle with some salt. Add another layer of radishes and sprinkle with salt. Repeat as necessary until all the radishes and salt have been used. Let sit for 2 to 4 hours until the radishes become slightly flexible. Flip them over 2 to 3 times while salting. Meanwhile, make the glutinous rice paste and cool. Mix all the seasoning ingredients well. 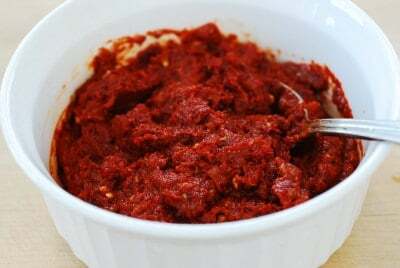 Set it aside for a while for the red pepper flakes to dissolve a little and become pasty. Rinse the radishes in cold water 2 times, and drain. Place the radishes back in the large bowl. Add the seasoning. Mix everything well by hand (use kitchen gloves), until the radishes and stems are evenly coated with the seasoning. The radishes will be a little dry at this point, but they will release water during the fermentation process. Store in an airtight container or jar. Before closing the lid, press the radishes down hard with your hand to pack them. Leave it out at room temperature for two days before storing them in the fridge. Kimchi will be ready in a few days in the fridge but takes about two weeks to fully develop the flavors. It maintains great flavor and texture for several weeks. You can make anchovy powder by grounding dry anchovies in a spice grinder. It works better if you cook dried anchovies for a few minutes in a heated dry pan before grounding. Or you can find commercially packaged dried anchovy powder in Korean markets. You can use it to flavor stews, soups, etc. When I was in Korea they called it cherry boy kimchi. I liked it a lot, one of my favorites. Why shouldn’t you peel the skin after scratching off impurities? The skin holds a lot of flavor and nutrients. The skin also keeps the radish crunchy. For these reasons, Korean cooks traditionally do not peel radish skin, especially the young radishes like these. Thank you. 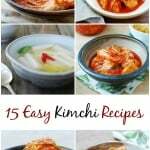 I’ve been waiting for a good chonggak kimchee recipe. Will definitely make it this spring. ? What is sweet rice paste and sweet rice powder? 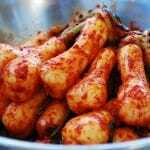 Could you give me the Korean name for it? I want to buy it at hmart and have no idea what I’m looking for. Thank you! Sweet rice is chapssal 찹쌀 Korean and powder is garu 가루, so look for 찹쌀가루. You can use Japanese Mochiko Sweet Rice Flour.